Santa Maria Novella is a church in Florence, Italy, situated just across from the main railway station named after it. Chronologically, it is the first great basilica in Florence, and is the city's principal Dominican church. 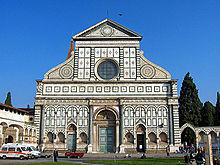 The façade of Santa Maria Novella, completed by Leon Battista Alberti in 1470. The church, the adjoining cloister, and chapter house contain a multiplicity of art treasures and funerary monuments. Especially famous are frescoes by masters of Gothic and early Renaissance. They were financed by the most important Florentine families, who ensured themselves funerary chapels on consecrated ground. This church was called Novella (New) because it was built on the site of the 9th-century oratory of Santa Maria delle Vigne. When the site was assigned to the Dominican Order in 1221, they decided to build a new church and adjoining cloister. The church was designed by two Dominican friars, Fra Sisto Fiorentino and Fra Ristoro da Campi. Building began in the mid-13th century (about 1246), and was finished about 1360 under the supervision of Friar Iacopo Talenti with the completion of the Romanesque-Gothic bell tower and sacristy. At that time, only the lower part of the Tuscan gothic façade was finished. The three portals are spanned by round arches, while the rest of the lower part of the facade is spanned by blind arches, separated by pilasters, with below Gothic pointed arches, striped in green and white, capping tombs of the nobility. This same design continues in the adjoining wall around the old churchyard. The church was consecrated in 1420. On a commission from Giovanni di Paolo Rucellai, a local textile merchant, Leon Battista Alberti designed the upper part of the inlaid green marble of Prato, also called "serpentino" and white marble façade of the church (1456–1470). He was already famous as the architect of the Tempio Malatestiano in Rimini, but even more for his seminal treatise on architecture De Re Aedificatoria, based on the book De Architectura of the classical Roman writer Vitruvius. Alberti had also designed the façade for the Rucellai Palace in Florence. Alberti attempted to bring the ideals of humanist architecture, proportion and classically inspired detailing to bear on the design, while also creating harmony with the already existing medieval part of the façade. His contribution consists of a broad frieze decorated with squares, and the full upper part, including the four white-green pilasters and a round window, crowned by a pediment with the Dominican solar emblem, and flanked on both sides by enormous S-curved volutes. The four columns with Corinthian capitals on the lower part of the façade were also added. The pediment and the frieze are clearly inspired by antiquity, but the S-curved scrolls in the upper part are new and without precedent in antiquity. The scrolls (or variations of them), found in churches all over Italy, all draw their origins from the design of this church. The frieze below the pediment carries the name of the patron : IOHAN(N)ES ORICELLARIUS PAU(LI) F(ILIUS) AN(NO) SAL(UTIS) MCCCCLXX (Giovanni Rucellai son of Paolo in the year of salvation 1470). The vast interior is based on a basilica plan, designed as a Latin cross, and is divided into a nave, two aisles with stained-glass windows and a short transept. The large nave is 100 metres long and gives an impression of austerity. There is a trompe l'oeil effect by which towards the apse the nave seems longer than its actual length. The slender compound piers between the nave and the aisles are progressively closer the deeper the observer moves into the nave. The ceiling in the vault consists of pointed arches with the four diagonal buttresses in black and white. The interior also contains Corinthian columns that were inspired by Greek and Roman classical models. The stained-glass windows date from the 14th and 15th century, such as 15th century Madonna and Child and St. John and St. Philip (designed by Filippino Lippi), both in the Filippo Strozzi Chapel. Some stained glass windows have been damaged in the course of centuries and have been replaced. The one on the façade, a depiction of the Coronation of Mary, dates from the 14th century, and is based on a design of Andrea di Bonaiuto da Firenze. The pulpit, commissioned by the Rucellai family in 1443, was designed by Filippo Brunelleschi and executed by his adopted son Andrea Calvalcanti. This pulpit has a particular historical significance, since it was from this pulpit that the first verbal attack was made on Galileo Galilei, leading eventually to his indictment. The Holy Trinity by Masaccio. The Holy Trinity, situated almost halfway along the left aisle, is a pioneering early Renaissance work of Masaccio, showing his new ideas about perspective and mathematical proportions. Its meaning for the art of painting can easily be compared to the importance of Brunelleschi for architecture and Donatello for sculpture. The patrons were the judge and his wife, members of the Lenzi family, here depicted kneeling. The cadaver tomb below carries in Latin the epigram: "I was once what you are, and what I am you will become". Of particular note in the right aisle is the Tomba della Beata Villana, a monument by Bernardo Rossellino executed in 1451. In the same aisle, are located tombs of bishops of Fiesole, one by Tino di Camaino and another by Nino Pisano. The Filippo Strozzi Chapel is situated on the right side of the main altar. The series of frescoes by Filippino Lippi depict the lives of Apostle Philip and the Apostle Saint James the Great and were completed in 1502. On the right wall is the fresco St Philip Driving the Dragon from the Temple of Hieropolis and in the lunette above it, the Crucifixion of St Philip. On the left wall is the fresco St John the Evangelist Resuscitating Druisana and in the lunette above it The Torture of St John the Evangelist. Adam, Noah, Abraham and Jacob are represented on the ribbed vault. Behind the altar is the tomb of Filippo Strozzi with a sculpture by Benedetto da Maiano (1491). The bronze crucifix on the main altar is by Giambologna (16th century). The choir (or the Cappella Tornabuoni) contains another series of famous frescoes, by Domenico Ghirlandaio and his apprentice the young Michelangelo (1485–1490). They represent themes from the life of the Virgin and John the Baptist, situated in the Florence of the late 15th century and containing portrayals of several members of important Florentine families. The vaults are covered with paintings of the Evangelists. On the rear wall are the paintings Saint Dominic burns the Heretical Books and Saint Peter's Martyrdom, the Annunciation, and Saint John goes into the Desert. The stained-glass windows were made in 1492 by the Florentine artist Alessandro Agolanti, known also as Il Bidello, and were based on cartoons by Ghirlandaio. This chapel, designed by Giuliano da Sangallo, is situated on the left side of the main altar and dates from the end of the 13th century. Here, on the rear wall, is the famous wooden Crucifix by Brunelleschi, one of his very few sculptures. The legend goes that he was so disgusted by the "primitive" Crucifix of Donatello in the Florence's church of Santa Croce that he made this one. The vault contains fragments of frescoes by 13th-century Greek painters. The polychrome marble decoration was applied by Giuliano da Sangallo (c. 1503). The stained-glass window and dates from the 20th century. The Cappella Strozzi di Mantova is situated at the end of the left transept. The frescoes were commissioned from Nardo di Cione (1350–1357) by Tommaso Strozzi, an ancestor of Filippo Strozzi. The frescoes are inspired by Dante's Divine Comedy: Last Judgment (on the back wall; including a portrait of Dante), Hell (on the right wall) and paradise (on the left wall). The main altarpiece of The Redeemer with the Madonna and Saints was done by Nardo di Cione's brother, Andrea di Cione, better known as Orcagna. The large stained-glass window on the back was made from a cartoon by the two brothers. The Della Pura Chapel is situated north of the old cemetery. It dates from 1474 and was constructed with Renaissance columns. It was restored in 1841 by Gaetano Baccani. On the left side there is a lunette with a 14th-century fresco Madonna and Child with St Catherine. On the front altar there is a wooden crucifix by Baccio da Montelupo (1501). The Rucellai Chapel, at the end of the right aisle, dates from the 14th century. Besides the tomb of Paolo Rucellai (15th century) and the marble statue of the Madonna and the Child by Nino Pisano, it houses several art treasures such as remains of frescoes by the Maestro di Santa Cecilia (end 13th – beginning 14th century). The panel on the left wall, the Martyrdom of St Catherine, was painted by Giuliano Bugiardini (possibly with assistance from Michelangelo). The bronze tomb, in the centre of the floor, was made by Lorenzo Ghiberti in 1425. The Spanish Chapel (or Cappellone degli Spagnoli) is the former chapter house of the convent. It is situated at the north side of the green Cloister (Chiostro Verde). It was commissioned by Buonamico (Mico) Guidalotti as his funerary chapel. Construction started c. 1343 and was finished in 1355. The Guidalotti chapel was later called "Spanish Chapel", because Cosimo I assigned it to Eleonora of Toledo and her Spanish retinue. Within the Spanish Chapel there is a smaller Chapel of the Most Holy Sacrament. The Spanish Chapel was decorated from 1365 to 1367 by Andrea di Bonaiuto, also known as Andrea da Firenze. 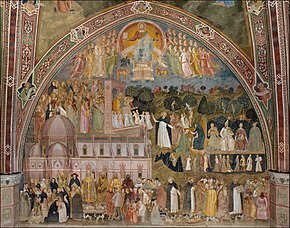 The large fresco on the right wall depicts an Allegory of the Active and Triumphant Church and of the Dominican order. It is especially interesting because in the background it shows a large pink building that some think may provide some insight into the original designs for Florence Cathedral by Arnolfo di Cambio (before Brunelleschi's dome was built). However, such an interpretation is fantasy since the Duomo was never intended to be pink, nor to have the belltower at the rear. This fresco also contains portraits of pope Benedict IX, cardinal Friar Niccolò Albertini, count Guido di Poppi, Arnolfo di Cambio and the poet Petrarch. The frescoes on the other walls represent scenes from the lives of Christ and St Peter on the entry wall (mostly ruined due to the later installation of a choir), The Triumph of St Thomas Aquinas and the Allegory of Christian Learning on the left wall, and the large "Crucifixion with the Way to Calvalry and the Descent into Limbo" on the archway of the altar wall. The four-part vault contains scenes of Christ's resurrection, the navicella, the Ascension, and Pentecost. The five-panelled Gothic polyptych that was probably originally made for the chapel's altar, depicting the Madonna Enthroned with Child and Four Saints by Bernardo Daddi dates from 1344 and is currently on display in a small museum area reached ed through glass doors from the far end of the cloister. Together, the complex iconography of the ceiling vault, walls, and altar combine to communicate the message of Dominicans as guides to salvation. Giorgio Vasari was the architect, commissioned in 1567 by Grand Duke Cosimo I, for the first remodeling of the church, which included removing its original rood screen and loft, and adding six chapels between the columns. An armillary sphere (on the left) and a gnomon (on the right) were added to the end blind arches of the lower façade by Ignazio Danti, astronomer of Cosimo I, in 1572. The second remodeling was designed by Enrico Romoli, and was carried out between 1858 and 1860. The square in front the church was used by Cosimo I for the yearly chariot race (Palio dei Cocchi). This custom existed between 1563 and late in the 19th century. The two Obelisks of the Corsa dei Cocchi marked the start and the finish of the race. They were set up to imitate an antique Roman circus. The obelisks rest on bronze tortoises, made in 1608 by the sculptor Giambologna. Benedetto da Maiano – the Tomb of Filippo Strozzi (1491) at the backside of the Strozzi Chapel. Giacomo Marchetti : Martyrdom of Saint Laurence. ^ H. Riaño, Peio (August 1, 2013). "Homosexuales que hicieron brillar a la Iglesia". El Confidencial (in Spanish). Retrieved February 3, 2018. ^ Roberts, Ann (December 5, 2016). Dominican Women and Renaissance Art: The Convent of San Domenico of Pisa. Routledge. p. 153. ISBN 9781351943000. ^ Cole, Bruce. "Masaccio". Encyclopædia Britannica. Cambridge University Press. ^ Kleinhenz, Christopher (August 2, 2004). Medieval Italy: An Encyclopedia. Routledge. p. 944. ISBN 9781135948801. ^ Erasmo, Mario (November 30, 2017). Strolling through Florence: The Definitive Walking Guide to the Renaissance City. I.B.Tauris. p. 135. ISBN 9781786722768. ^ Wackernagel, Martin (2011). The World of the Florentine Renaissance Artist: Projects and Patrons, Workshop and Art Market. University of Toronto Press. p. 41. ISBN 9781442611849. ^ Starke, Mariana (1839). Travels in Europe : for the use of travellers on the continent, and likewise in the Island of Sicily; not comprised in any of the former editions, to which is added an account of the remains of ancient Italy and also of the roads leading to those remains. A. & W. Galignani & Company. p. 73. ^ "Lessons for Theresa May and the EU from 15th-century Florence". The Economist. 24 September 2017. 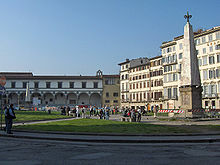 Wikimedia Commons has media related to Santa Maria Novella.